TAOISEACH LEO VARADKAR has committed to increase the point at which people pay the top rate of tax to €50,000 for a single person or €100,000 for a two income couple over the next five budgets. It’s being dubbed as an election promise, given the central message coming out of the Fine Gael Ard Fheis is that the party is election ready. The Taoiseach proposes to rise the threshold by €2,500 each year over the next five years. In October’s Budget, the government tinkered with the bands, increasing the entry point to the higher rate of income tax (40%) for all earners by €750, raising it from €34,550 to €35,300 in the case of a single worker. Speaking at his closing address this evening, the Taoiseach said elements of unfairness continue to persist in Irish society. “For example, people on average incomes in Ireland pay the highest rate of tax. The average full-time income is almost €46,000 but in Ireland we pay the top rate of tax on just over €35,000. “It discourages parents from returning to the workforce, discourages people who emigrated from coming home, and makes it harder to attract good jobs and talent to Ireland. It is holding our country back,” he said. He said his party will end that unfairness, but said it won’t be done in “one big dramatic move – we have learnt from the mistakes of Fianna Fáil. We’ll do it in a way that’s sustainable and affordable”. Over the last three budgets, Fine Gael and the Independents in government have increased the point at which people pay the higher rate of tax, but we must go further now. So, over the next five budgets, we will commit to increase the point at which people pay the top rate of tax to €50,000 for a single person or €100,000 for a two income couple. We will end this unfairness and allow hard-working people keep more of the money they earn. They deserve it! Despite the confidence and supply talks continuing, with the pressure between the two parties has escalated this weekend, the Taoiseach used his speech to take a swipe at Micheál Martin. “I said it’s not easy negotiating with the Fianna Fáil front bench. Just ask Micheál Martin,” he joked. However, he told his members that he is confident a deal to provide political stability can be secured. “We will need it as we lead our country through Brexit in the year ahead,” he said. Harking back to Enda Kenny’s speech of referencing chats with the grassroots like the man with two pints, Varadkar mentioned chats he had with a number of members from Limerick to Tipperary. I know how hard the self-employed work on every main street, side street, and shopping centre in Ireland, and in every small business. They create their own jobs and create jobs for others.I know the risks they take, and I know how hard it can be to do the simplest things like take a day off for a family funeral or a First Holy Communion. He outlined some of the measures the government has introduced increases in tax credits, new benefits like dental and optical, and access to the invalidity pension for the first time. “And we’re not done yet,” said the Taoiseach. Varadkar told the packed out conference hall that he now wants to full equality for the self-employed when it comes to income tax. “There’s no reason why someone who’s self-employed should pay more income tax than those of us who are PAYE. “And a safety net for a self-employed person who loses their job or business through no fault of their own. In Fine Gael we believe in rewarding work. We believe in making work pay. And we believe that people should have the freedom to make their own decisions about how to spend their hard-earned money,” said Varadkar. The Taoiseach also used a personal story to navigate into the housing crisis in his speech today. He said Lynda told him she’s worried about housing. She has a job, is working hard, and doesn’t know if she’ll ever be able to afford a house, or be able to save enough for a deposit. “I hear stories like that every day and these stories motivate me to solve this problem,” he said adding that yesterday at the opening of a new housing development he “saw the joy in people’s faces when they got the keys to their new home”. “That sense of relief and security you feel after years of waiting or saving for your first home. I want that to become a reality for everyone in Ireland. “Fine Gael believes firmly that every family should have a roof over their head, a place to call home. Fine Gael is the party of home ownership. And now it is our mission to ensure that home ownership becomes achievable and affordable again for many who today feel it is beyond their reach,” he said. Taking another swipe at Fianna Fáil, he said the housing crisis was many years and perhaps decades in the making, stating that Fine Gael inherited the mess off Fianna Fáil. “Broke banks unable to lend, ghost estates, Pyrite, Mica, Priory Hall, hundreds of thousands of people in negative equity, mortgage arrears, and hundreds of thousands of construction workers on the dole. “It was never going to be easy to turn things around but bit by bit, just as we did when it came to unemployment and the economy, we will,” he promised members today. 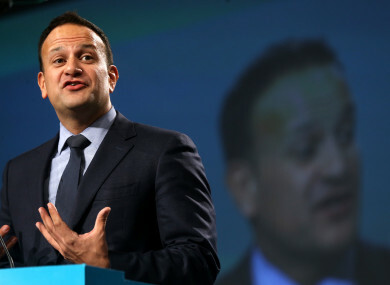 What could be seen as yet another rallying call for a general election, Varadkar said he sometimes despairs when he hears the economic policies of some of the opposition parties. We all know the Fianna Fáil motto: ‘when we have it, we spend it’. We all know where that led us. And we’re not going back. But it wasn’t just Fianna Fáil that was being shot down this evening, it was Sinn Féin and the parties of the “hard left” which the Taoiseach said “are even worse”. “When they don’t have it – they’ll just borrow it,” he said. The Taoiseach did have some criticism for his own party in his address this evening, repeating the line that Ireland is a “laggard” on climate action. “We are already a world leader on recycling. Now we must go from laggard to leader on climate action. New laws coming our way to protect our environment include a ban micro-beads and smoky coal nationwide, and the implementation of an EU wide ban on single use plastics. Email “Taoiseach promises to raise top rate of tax to €50k over next five years”. Feedback on “Taoiseach promises to raise top rate of tax to €50k over next five years”.